EMU Casino is a brand of Australian online casinos with over 500 casino games accessible to play from the gambling industries most innovative software providers. EMU Casino is available for players all over the world to play. The Casino offers top-notch security systems and is licensed by Curacao authorities. Thus, ensuring players a safe and reliable gambling experience. The games provided by the EMU Casino are available in instant play modes on both web and mobile. The casino houses a robust list of slot machines which include Betsoft, 1×2 gaming, Big Time Gaming, Multislot, Quickspin, Oryx, 2by2, Genesis, RabCat and Playson. The casino games offered by EMU is powered by Microgaming and Net entertainment, which are the leading suppliers of progressive jackpot slots. Majority of the games are available to be played directly from the casino, while a small amount of games requires players to download a software client before they can play. The games offered by EMU Casino can be placed into different categories. This makes it easy to find the game and to distinguish between the different games on offer. If a player is looking for a specific game, they can search for it by the software developer or the theme they have in mind. The casino houses all sorts of games, from table game variants to number games. It has the most varied collections of online Keno. EMU Casino has wide selection of games, guaranteeing you that you will find anything you looking for. EMU offers players some of the best casino promotions and bonus offers. The offers range from welcome bonuses, sign-up bonuses, EMU casino races and loyalty programs. Upon sign-up at EMU Casino, players will be rewarded with twelve free spins that are awarded without a deposit being made. The free spins can be used on a selected pokie games, with a 25x play-through requirement before you can cash out your winnings. Players who sign-up for the first time at EMU Casino and make a deposit can receive bonus money up to AU$300. The money is divided over the player’s first three deposits, with the match percentage depending on the location from which you are playing. The bonus is subject to wagering requirements and is only distributed to every player once. The EMU Race is exclusive to EMU Casinos and is competitions or tournaments that allows players to win bigger when playing real money pokies. The Race is won by players who place the most slots within a certain time-frame. The winner of the race can be awarded additional prizes on top of their winnings. You can see which races are on the way by going to the Casino races tab on the casino’s main page. The loyalty program provides players with a variety of ways to earn points. Therefore, the loyalty program is known as EMU Points. When you become a member of EMU Casino, you are automatically granted 1000 points to start off. For every AU$100 that you deposit, you will receive 500 points. Regular gamblers at EMU Casino will be awarded 200 points every time they log in and play. Points are also given to players for every real money wager placed on any game. The EMU Casino website stipulates that they will shortly be rewarding players for referring friends, making their first withdrawals and for uploading identity documents. The casino has presented gamblers with multiple convenient ways to deposit and withdraw money from the casino. There are standard payment methods all of which are protected by spyware with a Thawte SSL security certification, these methods include e-wallets and bank cards. The casino allows players to cash out once a month without a fee being charged. Players who wish to withdraw more money will be charged with a fee of up to 3.9%. The transaction methods include Credit/debit cards, Skrill, Neteller, POLi, Paysafecard and bank transfers. These options all have a deposit time that is instant. So, players can start playing and enjoying the online casino games immediately. The withdrawal methods are the same as the deposit methods, with the exclusion of instant withdrawal time. Credit/Debit cards, Skrill and Neteller, have a withdrawal time of 24 hours. POLi and Paysafecard cannot be used to withdraw winnings. Bank transfers, on the other hand, have a withdrawal time of up to 10 working days. All of the banking methods have deposit and withdrawal limits. So, players need to make sure they familiarise themselves with the different banking methods to ensure that they don’t get confused once they decide to withdraw or deposit cash. The Casino has made it easier for players who enjoy gambling to continue playing wherever they are, through playing on their mobile devices. The EMU Casino is optimised to be mobile-friendly. Meaning, that players can play from any platform they desire, be it Android, IOS, Windows or the traditional desktop. Accessing the casino from your mobile device is easy. All you have to do is have a great internet connection, log in through your mobile web-browser, sign-in to your original casino account and start enjoying the games. The mobile version of the casino is the same as the desktop version and offers you the same games, betting options, wagering requirements and banking methods. So, be sure to take your mobile casino everywhere you go. 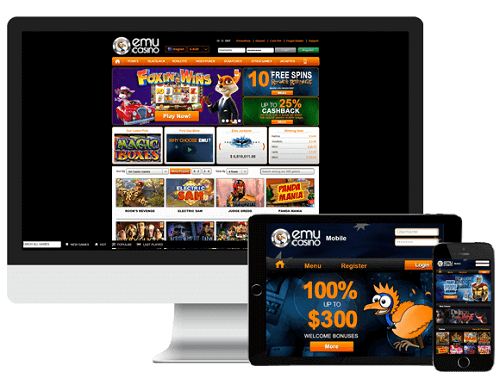 The brilliant thing about EMU is that it is an instant play casino. So, players can access the games directly from their web-browser, be it on a mobile device or computer. Gamblers are not required to download any additional software to enjoy the games. Although, you will need to enable Adobe Flash on your computer, but, many computers come standard with it. If your computer does not, you can download Flash directly from the Adobe website. EMU Casino is transparent when it comes to its services. EMU Casino is certified by one of the leading jurisdictions for online gambling, Curacao e-Gaming. The casino is examined on a monthly basis by eCOGRA which ensures that pay-out rates are unbiased and fair. The casino has a 256-Bit SSL (Secure Socket Layer) to protect players payments and the financial matters are led in accord with internationally recognised procedures. All the information regarding safety and security can be read on the ‘security and ethics’ page on the casino’s website EmuCasino.com.